The animated adventures of the crazy trio. Moe: I say, Jasper, what comes after seventy-five? Quite possible the funniest short they did. Disorder in the Court is truly one of the funniest shorts The Three Stooges ever made. The timing and delivery of the jokes was pure perfection for Larry, Moe and Curly. 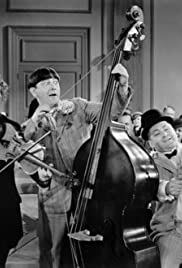 Some of the "special effects" were pure hilarity, such as the scene where Larry flings the bow from his violin, removing the stenographer's toupee. This short is truly a testament to brilliance of their slapstick. Almost 70 years later, and The Stooges are still being televised and sold on video and DVD. For anybody that wants to familarize themselves with the Stooges, or for any fan that wants 20 minutes of unstoppable laughter, Disorder in the Court is perfect.